View of Auvers sur Oise was created between 1873 and 1875 and is admired for its wide open spaces and swirling green colors. The work was produced during a time of change in Cézanne's career, when he was experimenting with his color palette beyond his usual tempestuous dark choices. View of Auvers sur Oise was painted when Cézanne was staying with his good friend Dr Paul Gachet in the 1870s. The two had met in Pontoise where Paul Cézanne was living with his mistress and future wife, Hortense Fiquet, and his newborn son Paul. Dr. Gachet was a big admirer of Cézanne's works and recognized his potential. Consequently the doctor invited the artist to come and stay at his house and paint the surrounding landscapes. 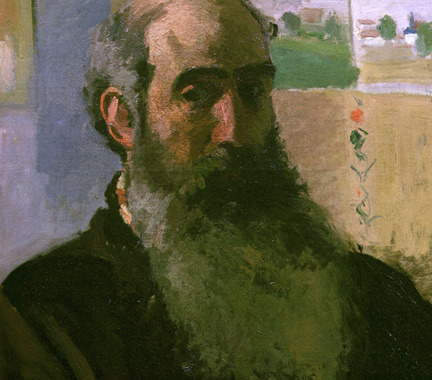 Cézanne obliged and began painting alongside his good friend Camille Pissarro, an Impressionst. 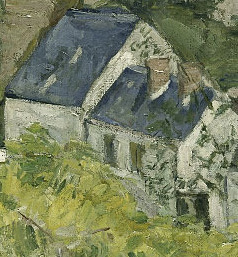 Cézanne was encouraged to use lighter colors when working on this piece. yet, rather than create a swirling, bright, impression of nature Cézanne believed that nature should be shown as accurately as possible. For Cezanne, there was no one way to view subject matter because objects were constantly in flux. For example every time that Paul Cézanne sat down to paint View of Auvers sur Oise he copied whatever he saw at that time rather than finish what he had seen the first time he looked at the landscape. Additionally, Cézanne believed that it was possible to analyze and break nature down into small shapes. Thus, he looked at the panoramic landscape and houses as a group of shapes that, when placed on the canvas, would create an accurate representation of what he saw. It was difficult for Cézanne to finish a piece like View of Auvers sur Oise because it took him an extraordinarily long time to finish a painting. He was a slow worker and when painting a landscape, a great deal would have changed between what he saw at the beginning of his painting process and the end. Furthermore he often chose to paint his landscapes from difficult to reach vistas that were not easily accessible with his painting gear. Consequently, Cézanne did not finish View of Auvers sur Oise, which is obvious because the piece has never been signed or dated. Paul Cézanne was inspired by the beautiful surroundings of Auvers sur Oise. A great nature lover, he was charmed by the village and had never truly enjoyed living in the big city of Paris. 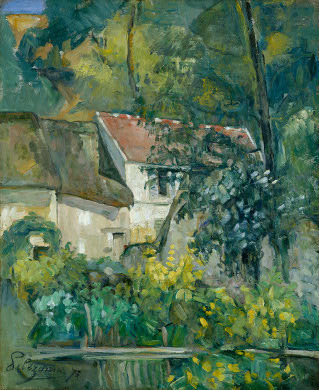 Painting alongside Camille Pissarro, Cézanne was encouraged to paint from nature rather than romantic, religious themes. Although Cézanne never fully embraced the Impressionist style, he was clearly inspired by their manner of artistry, due to the fact that he painted en plein air with swirling, bright colors. The center space of View of Auvers sur Oise is dominated by block houses that stretch across the rolling landscape. Whereas the houses in the forefront of the image have been painted with intricate detail, those in the background are simple rectangles and squares with distinctive colors distinguishing the walls and roofs. The rolling hills stretch out into the horizon and appear almost flat. Although they take up almost one third of the canvas, they do not arrest the viewers' attention. The trees in the foreground are attention grabbing due to their bright colors, and the fact that they encroach onto the houses' space. The lofty tree that stands tall in the center of the scene gives the impression that the trees and the hills meet, as though there is almost no village sat in the middle of the composition. Cézanne used swirling green, yellow and grey shades and the buttercup yellow tones of the leaves and the mint green shades of the grass lend themselves to a sunny day. In contrast the sky is a tumulus dark grey tone, created with dirty blues and murky whites. The painting is brightly lit in the foreground with sunny yellows and vibrant green shades. Also the orange and red rooftops add to the bright scene. Yet, despite the peaceful tone of the painting there is a threat of a storm on the horizon because of the grey skies in the background, threatening to ruin the calm of the day. The brush strokes of View of Auvers sur Oiseare rough and hurried. Cézanne liked to use a large brush with perceptible brush strokes that are obvious to the viewer. 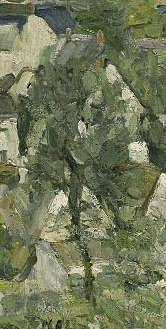 Such a technique leaves the piece with an unpolished quality, which is why Paul Cézanne frequently had his work refused entry into the Salon's exhibitions. 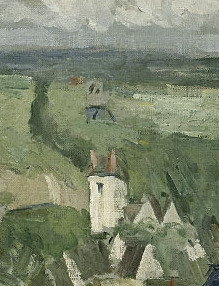 Cézanne's View of Auvers sur Oise was not considered a finished piece by the artist and it was not exhibited after it was first created. However when painter Emile Bernard saw the work he was said to be highly impressed by Cézanne's originality. Having discussed with Cézanne the staleness of other artists' landscapes Bernard's critical reception of View of Auvers sur Oise was highly positive. After Paul Cézanne passed away the painting was sold by Dr. Paul Gachet to the art dealer Ambroise Vollard. 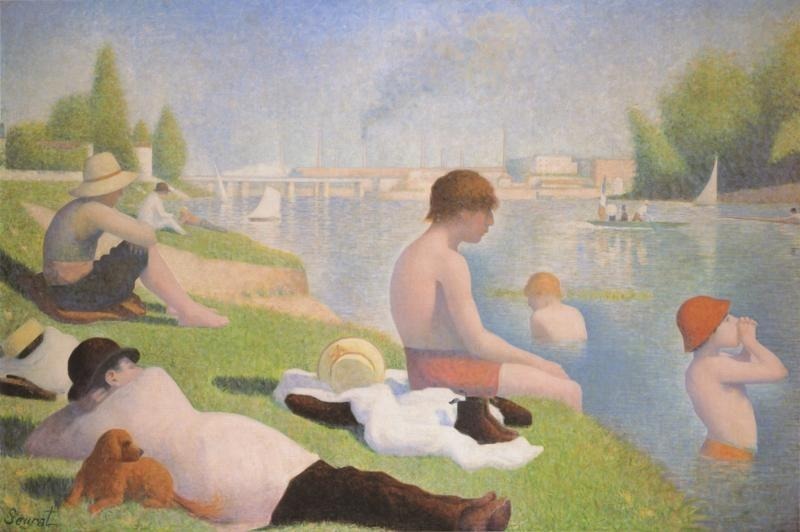 It was a popular painting that was passed between a number of owners in Paris before being bequeathed to the Chicago Institute of Art in 1932. View of Auvers sur Oiseis considered one of the foremost works for understanding how Paul Cézanne changed his style during his career. Like in View of Auvers sur Oise Camille Pissarro's influence can be seen on Cézanne's palette knife. The paintings share the same bright yellow and green colors for the foliage, which is reflected in the water. Furthermore the vivid orange tone of the roof is reminiscent of the small block houses stretching across View of Auvers sur Oise. 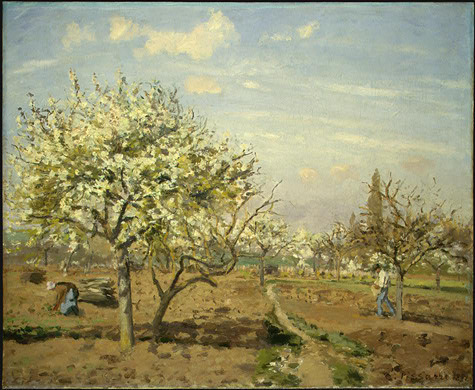 This painting shows Pissarro's hopes for a brighter future in France (the painter had fled to London, England, during the Prussian war) with a clear sky and flourishing nature. The landscape stretching into the horizon is evocative of the rolling hills in Cézanne's View of Auvers sur Oise. Paul Cézanne was born in Aix-en-Provence, France, in 1839 to a banking father and a loving mother. 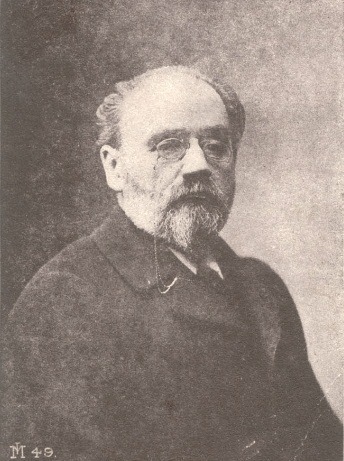 He had an idyllic childhood and met the famous writer Emile Zola at school. The two became close friends and moved to Paris to pursue their chosen careers. During this period Paul Cézanne was painting dark pieces of a religious or romantic nature. However, after meeting the Impressionist Camille Pissarro in the late 1860s Cézanne widened his color palette and adopted lighter, more vivid colors. View of Auvers sur Oise was never exhibited but after his death Cézanne was widely praised for his modern painting methods and his work is now seen to have been highly influential. Post-Impressionism describes the period of time in the late 1880s when younger artists were rejecting the Impressionistic style and trying new and different methods of creating art. Paul Cézanne did not wish to belong to any particular art movement. He considered himself to be a maverick that branched out with his own approach to painting. Nevertheless, when he created View of Auvers sur Oise he was under the direct influence of the Impressionist Camille Pissarro. The light, bright swirling colors are reminiscent of the Impressionist manner of painting. 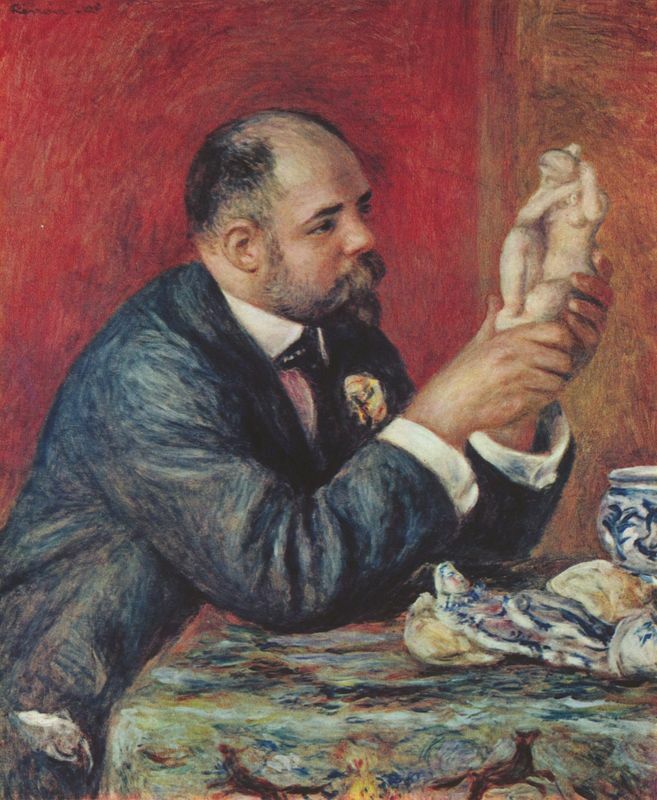 It was not until later in his career that Paul Cézanne began to work in what is now considered to be his signature, Post-Impressionist technique.